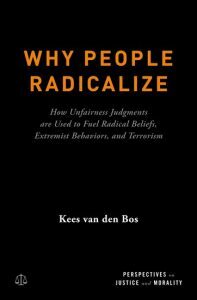 Why People Radicalize, Kees van den Bos argues that if we want to truly understand radicalization and prevent, attenuate, and fight violent extremism and terrorism, we must pay attention to what is driving the radicalization process. This implies that we should systematically analyze how radicalizing persons interpret the world. For example, perceptions that certain situations are fundamentally unfair and hence need to be changed are among the core issues that drive Muslim, right-wing, and left-wing radicalization. Furthermore, experiences and perceptions of unfairness and injustice can tempt those who struggle with self-control to break the law and engage in violent extremist and terrorist behavior. Why People Radicalize is among the first attempts to provide a systematic, integrative, and in-depth analysis of the psychology of unfairness judgments and the ways these judgments impact on various radicalization processes. Discussing several conceptual and practical implications that follow from this line of reasoning, the book emphasizes the role of careful scientific thought and the notion of taking individuals seriously, as judgments of unfairness are not merely perceptions. They feel genuine to the persons forming the judgments. This volume discusses in detail how these radicalization processes can develop and what components are of pivotal relevance in these processes. Accessible for scientists, professionals, and practitioners, the book explains how uncertainty and insufficient self-corrections influence this process. Finally, the book delineates future research issues on radicalization, extremism, and terrorism and applies the analysis to appropriate legal contexts, making the book relevant for policy and decision makers, among others.